This portfolio page features car safety features drawings, illustrations and diagrams showing occupant safety and passive restraint devices, body structural reinforcements, crash bumpers, crumple zones, structural door pillars and door beams, seatbelt tensioners, airbags, anti-lock braking systems, active stability controls, anti skid and traction control, driver visibility and more. 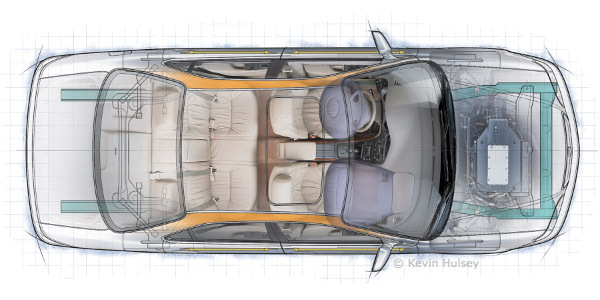 The above illustration shows a passenger car's structural roof reinforcements, door pillars, crash bumpers, and door beams, anti-lock braking systems. 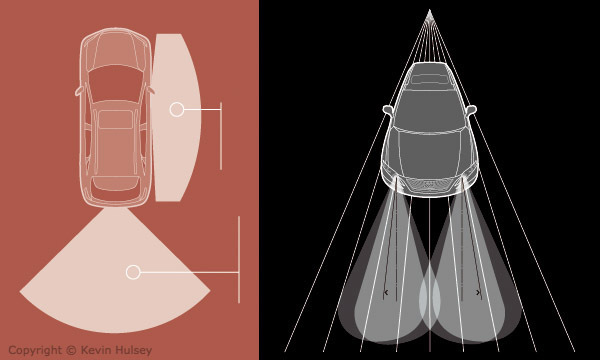 The image to the left shows occupant visibility past the car's door pillars, and the image to the right shows headlight high beam and low-beam distance and spread. The ABS diagram on the left shows the effects of braking on a curve in a car with anti-lock bakes. 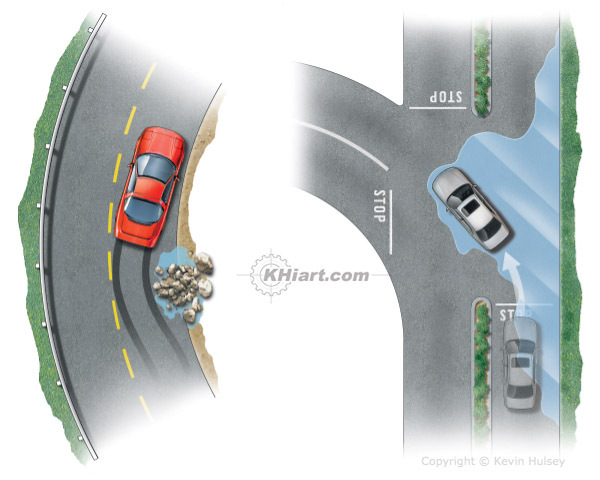 The diagram on the right shows the effects of a car on wet pavement with active anti-skid traction control. 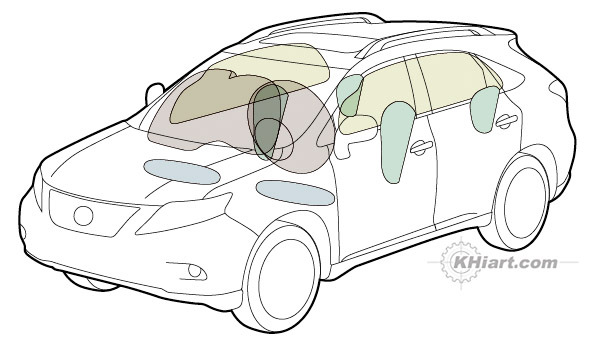 This diagram illustrates a compact SUV multiple driver and passenger airbags including side impact, and knee protection. 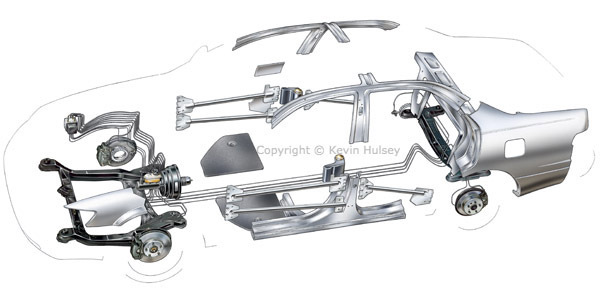 This illustration shows a truck's undercarriage ladder frame chassis with fuel tank, exhaust and driveline. 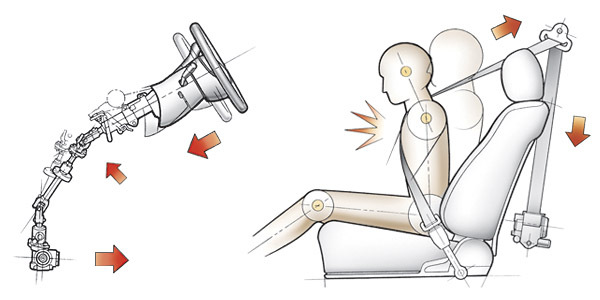 These two diagrams show a passenger car's collapsable steering and occupant passive restraint seat belt tensioners. 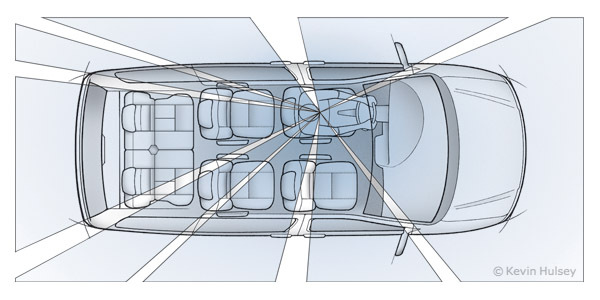 This diagram shows a minivan's full range of driver visibility and door pillar blind spots in a 360 degree radius. 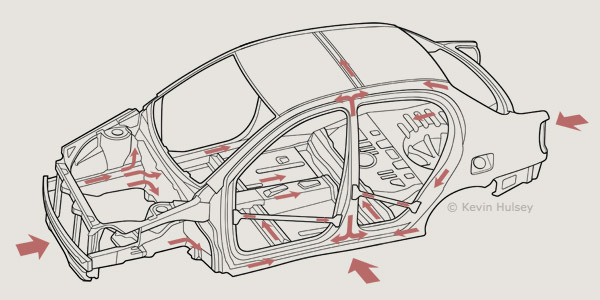 The diagram above shows a compact economy car's crumple zones and crash impact absorbing capabilities when the collision energy is dispersed through the unibody frame structure. These two illustrations above depict passenger seat construction (left) and a car dashboard console with driver and passenger airbags deployed. These two diagrams depict the frame construction of a medium duty truck chassis. This diagram depicts a pickup truck's front impact crumple zone.